During an Invent Your Scent Live! session, guests are provided a kit containing six different liquid fragrances and various tools to make their own personalized fragrance. Flip through any number of women's magazines and you'll likely come across an article on how to find your best scent, offering advice on which new perfume to buy based on your zodiac or your fashion style or your favorite color. But instead of picking a celebrity-branded bottle off the shelf at your local beauty retailer or department store, why not create a personalized fragrance? On Monday, Jan. 29, there will be a perfume-making party at Gran Caffe L'Aquila, an Italian restaurant in Center City. RELATED: Nighttime beer garden opening inside Academy of Natural Sciences | The bridal suite is "every Anthropologie girl's dream room"
Attendees will be guided by "scentertainers" to perfect their one-of-a-kind perfumes. Tickets for the event are $59 per person and include a complimentary glass of prosecco. 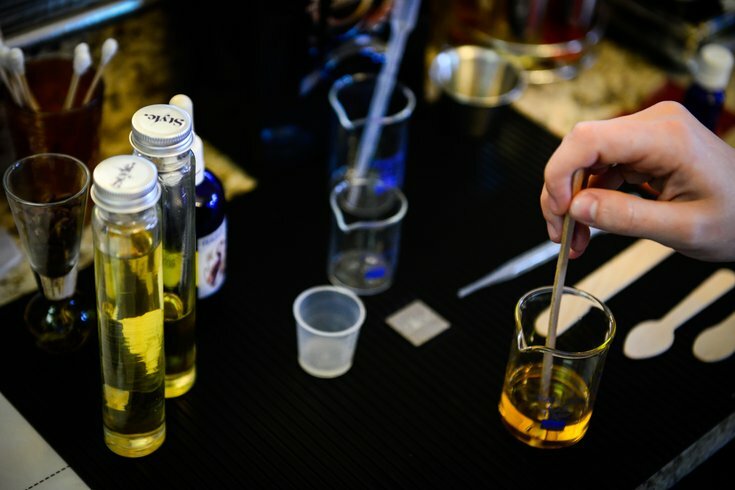 The Gran Caffe L’Aquila event is the first in what will be a regular schedule of Invent Your Scent programs planned for the Philadelphia area.